Rubber is a native of the Amazon basin and introduced from there to countries in the tropical belts of Asia and Africa during late 19th century. Rubber can be grown from sea level up to an altitude of 500 m in areas of well distributed annual rainfall of not less than 200 cm and a warm, humid equatorial climate (21 – 35ºC). Rubber is a quick growing, fairly sturdy, perennial tree of a height of 25 to 30 m. It has a straight trunk and thick, somewhat soft, light brownish gray bark. The young plant shows characteristic growth pattern of alternating period of rapid elongation and consolidated development. 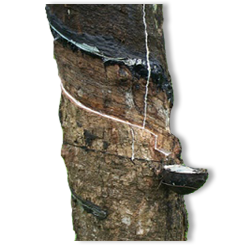 Rubber trees have a well-developed taproot and laterals. The bark on tapping yields latex. The leaves are trifoliate with long stalks. Normal annual leaf fall, known as wintering occurs in the case of mature trees during the period of December–February in South India. Re-foliation is quick and copious flowering follows. Flowers are small and appear in large clusters. Fruits are three lobed, each holding three seeds. The seeds are oil bearing. The rubber tree may live for one hundred years or even more. But its economic life period is only around 32 years (7 years of immature phase and 25 years of productive phase). The reaction of natural rubber in combination with sulphur (vulcanization) converts the plastic and viscous nature of raw rubber into elastic. Vulcanized rubber will have very high tensile strength and comparatively low elongation. Its hardness and abrasion resistance also will be high when compared to raw rubber. Because of the unique combination of these properties, natural rubber finds application in the manufacture of a variety of products. The main use of natural rubber is in automobiles. Other than tyres, a modern automobile has more than 300 components made out of rubber. Many of these are processed from natural rubber (NR). Uses of NR in hoses, footwear, battery boxes, foam mattresses, balloons, toys etc. are well known. NR now finds extensive use in soil stabilization, in vibration absorption and in road making.